An excellent Saturday programs begins with a state-bred maiden claiming sprint for fillies and mares. #5 Christy Jackson was 61-1 in her debut but ran a whole lot better than that, finishing full of run to be a strong runner-up in a better than par race for the level. If she can produce a forward move – or even run pretty much the same race – she’ll be a major player right back. #6 Affirmed Dixie has shown a bit of ability for top trainer Phil D’Amato in a series of drills at Los Alamitos and clearly won’t have to be any champion to be a live item at this level. With main man Tyler Baze aboard, the daughter of Dixie Chatter is a “must use.” We’ll use both in our rolling exotics while preferring Christy Jackson on top. #2 Angel Lane broke her maiden in clever fashion and looks capable of scoring right back in this $16,000 affair restricted to 3-year-old fillies. The Mike Puype-trained daughter of Congrats looks like the controlling speed again and should take full advantage of the projected race flow. At 9/5 on the morning line and likely to go lower, she won’t offer much value in the straight pool but we can use her as a rolling exotic single. The third race is a starter’s allowance sprint that seems fairly competitive. We’ll try to survive and advance using just two. #5 Basinca, a first-time gelding, finished a solid second in a fast, highly-rated race while earning a career top speed figure and a similar effort today should be good enough to land him in the winner’s circle. He became eligible for this race when finishing behind the streaking Navy Hymn when dropping into a $40,000 claimer last month and is protected today. #1 Concord’s Star broke his maiden for fun in his recent comeback and speed figure that was identical to what Basinca just achieved. He may have a bit more room to improve than his chief rival but will have to overcome the rail. Basinca gets a very slight edge on top but either one can win. The fourth race is a highly-competitive maiden juvenile sprint with several top prospects in the line-up. We’ll go with three fresh faces, but best advice is to spread as deeply as you can afford to. #6 Klimt, a son of Quality Road, was very impressive breezing a quarter pole in 20 4/5 seconds and then brought $435,000 at the OBS March sale. He’s trained like he’s fit and ready for Bob Baffert and should come out firing. #7 Chasing Aces, a $225,000 Barretts Sale purchase, acts like a colt with a future and Miller usually sends him two year old maidens out fit and ready. He’s a “must use” at 6-1 on the morning line. #5 Law Abidin Citizen has worked better than his moderate final times would indicate and lands Mike Smith. The son of Twirling Candy is trained by Mark Glatt, whose first-timers often get fit without advertising themselves. We’ll put the Baffert colt, Klimt, on top and may have an extra ticket or two with him in the win pool. The fifth race is a powerful entry-level allowance sprint – one of the tougher races for this level in recent months – and it will take a very fast colt to win it. #5 Jazzy Times was 50 cents on the dollar to repeat the quality of his impressive debut maiden win at Churchill Downs last month but weakened in deep stretch and wound up third. Perhaps he was brought back too quickly – 23 days – by trainer Bob Baffert but he’s had close to a month off since that race and seems capable of bouncing back with a huge run. With Rafael Bejarano taking the call, the son of Discreetly Mine seems like the one to beat. #3 Forest Blue, a closing second behind future stakes star Drefong in a blistering race in his comeback, should run at least as well if not better today for trainer Peter Miller and has the style proper stalking/closing style for this extended sprint trip. There’s a bit of value here at 4-1 on the morning line if you can get it. #8 Who’s Out was a tad rusty in his comeback and wound up a distant second behind Navy Hymn in a hot sprint earlier this month. If he moves forward off the race – just as he did in his second career start last year – the Jerry Hollendorfer-trained colt will be bearing down the leaders late. The seventh race, a state-bred entry-level allowance sprint, is another tough affair that offers several possibilities. #4 Devil’s Informer may rate a slight edge on top; the lightly-raced son of Informed gets a break in the weights with the switch to bug boy Lindsay, adds blinkers for the first time, exits a productive race, and shows a bullet five furlong workout for high percentage trainer Phil D’Amato just six days ago. He earned a huge figure when breaking his maiden at first asking last summer before being stopped on, and in this, his second start off a layoff, he should step forward considerably after appearing to be a dead short horse in his comeback in March. #7 Taman Guard won cleverly at Los Alamitos in his debut in April but then faded readily as the 6/5 choice when moved to the big track last month. The intense early fractions of that race probably did him in; today’s projected race flow doesn’t look quite as hot. #8 Family Code has won two of four outings over the Santa Anita main track and should fire another big shot today. He may lack the upside of some of the others but he’s always tries and should have every chance from his outside post. Straight maidens meet over a mile in the seventh race. #2 Westfest has burned a whole lot of money during his three race career, finishing in the money in each outing but doing so at odds of 6/5, 6/5 and even money. However, don’t be too harsh; the son of Unbridled’s Song is quite strong in the speed figure department and should enjoy this stretch-out to a mile. We’ll give him one more chance. #7 Giant Expectations might not be able to handle a good maiden, but it takes a good one to handle him. Fast on figures and exiting a powerful race (in which he wound up more than seven clear of the others), the son of Frost Giant should be well positioned and be ready to pounce. We’ll use both in our rolling exotics and then press a bit with Westfest on top. The Triple Bend Stakes, at the extended sprint distance of seven furlongs, should boil down to the speedy #6 Subtle Indian and the ultra-talented but inconsistent #4 Lord Nelson. Subtle Indian clearly is the controlling speed but has never been tested over this longer trip. He’s never been a run off, so there’s a chance he can establish the pace, slow it down, re-break and hold sway. Breathing down his neck throughout could very well be Lord Nelson, a fast, highly-rated winner of his comeback for Baffert but wheeling back relatively quickly in 22 days. If the son of Pulpit runs back to his most recent performance, he’s probably the one to beat, and this distance should be right up his alley. We’ll give the Subtle Indian a very slight edge on top – he’s won seven of 10 starts and always lays his body down – but both must be included in rolling exotic play. 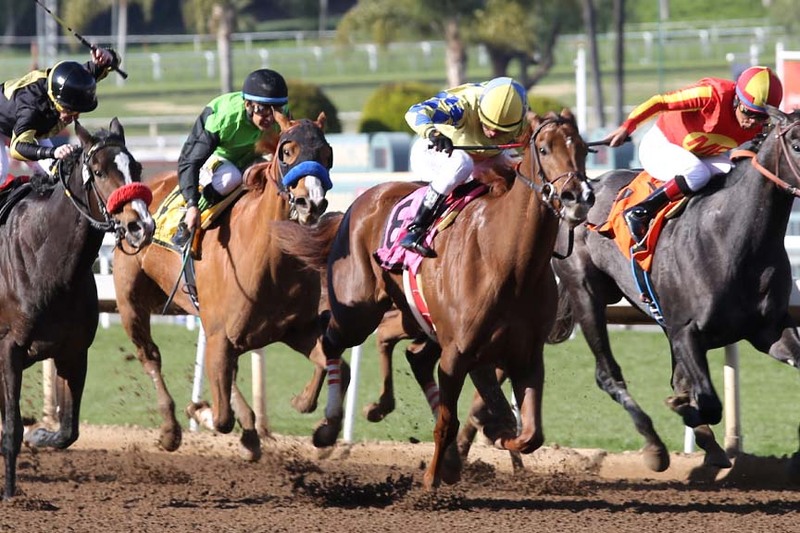 The Gold Cup at Santa Anita completes the card, with the10 furlong main track classic featuring Santa Anita Handicap winner #7 Meltonin and the streaking winner of three straight, #2 Second Summer. Meltonin lost little in defeat his most recent outing when second to Effinex in the Oaklawn Handicap in mid-April; he returns to the track and distance of his Big ‘Cap score and his works indicate he’s ready for another huge effort. Second Summer keeps improving with each outing, as indicating by his rapidly rising speed figures, and there was nothing flukish about his recent score in the Californian Stakes. The Summer Bird gelding should adore today’s 10 furlong trip. We’ll try to get by using just these two, with preference on top to Second Summer.